Rescued from Laurel's ambush by the aid of the mysterious woman in black and her sonic... "thing", Ollie is ready to make finding the city's newest vigilante his number two priority, right after coping with his mother's bail hearing. Yet Ollie is forced to place everything on the back-burners and assign the task of tracking her down to Roy Harper after he receives an urgent request for help from an unlikely source - Officer Quentin Lance! The Dollmaker - a serial killer Lance has a history with - escaped from Iron Heights along with a number of other criminals during The Quake and the police department is more concerned about keeping that fact a secret from the press and the public than in catching the killer. Lance has been ordered to back-off the case, threatened with Obstruction charges if he even so much as shows up to a homicide scene to put up the police tape. Someone has to do something and as much as Officer Lance hates to admit it, The Arrow - as he now calls the Starling City Vigilante - is the only option. In the island flashbacks, Ollie and Slade leave Shado to examine the body of the WWII era Japanese soldiers they discovered in a hidden cave. The island is bombarded shortly thereafter and the episode ends with Shado and Slade's fates uncertain and Ollie held prisoner on a boat. Green Arrow: Year One (The Island Sequences), Detective Comics: Faces of Death (inspiration for modern Dollmaker), The House of Wax movies (Dollmaker's method of killing his victims), Gail Simone's Birds of Prey (character of Sin and various details regarding The League of Assassins), numerous Dennis O'Neil stories involving The League of Assassins and various Mike Grell stories that features Green Arrow partnering up with a reluctant cop and/or hunting a serial killer. One wonders at this point if the Starling City Police Department and District Attorney's office are hopelessly corrupt or totally incompetent. Ignoring the DA's unprofessional behavior during Moira Queen's bail hearing (presumably the District Attorney is an elected post in Starling City and he's jockeying for votes), one has to wonder just how The Dollmaker was able to kidnap Laurel and Quentin from work. You'd expect the DA's office to have decent security. Ditto the police station parking garage. And Lance's superiors must have REALLY wanted to bust him down a peg in order to allow a wounded serial killer to escape because it was more important to arrest Quentin Lance for obstruction. Paul Blackthorne steals the show as Quentin Lance. He sells every contrivance of the plot that might otherwise have seemed to have been a bit much. The writing team gave him most of the good speeches in this episode and Blackthorne justifies their faith that he could pull such drama off. There's even some good non-verbal acting that seems to suggest Quentin has figured out Oliver's secret identity. The opening action sequence with Black Canary rescuing The Hood from the police. Lots of references to DC Comics New 52 in this episode. Quentin Lance's call-sign is DC-52. The Dollmaker's hotel room number is 52. And Ollie's preferred news source is Channel 52, which is also the name of a weekly back-up feature in DC Comics which discusses important news around the universe. Black Canary's follower, Sin, is a reference to a character created by Gail Simone during her run on Birds of Prey. Sin was a young girl who was being groomed by The League of Assassins to become their greatest warrior. She was saved from this fate by Black Canary who adopted the girl and took her back to America. There are many DC Comics villains who have used the name of The Dollmaker. The first was a Plastic Man villain who used magical dolls in a manner akin to the Fantastic Four villain The Puppet Master. The second was a Supergirl villain who was basically a second-class Toyman, who focused exclusively on weaponized dolls. The third and final one was introduced in Detective Comics' first storyline after the New 52 Revamp and was a brilliant surgeon/serial killer who made dolls out of parts of his victims. The Arrow version of The Dollmaker shares a name - Barton Mathis - with the New 52 Dollmaker but his M.O. involves physically transforming his victims into giant porcelain dolls. The Dollmaker's lawyer's name is Tony Daniel. Tony Daniel is also the name of the writer who created the modern version of The Dollmaker in the comics. Black Canary uses Heritage Hall - a building with a large clock tower - as her base of operations. In Birds of Prey, Oracle and Black Canary operated out of the Gotham Clock Tower. The name Metamorpho Chemical - the failed company The Dollmaker uses as a hideout - is a reference to the Rex Mason a.k.a. Metamorpho, The Element Man - a superhero who had the power to change his body into any elemental compound. The ninja Black Canary kills at the end of the episode drops the name of Ra's Al Ghul. Probably best known for being the main villain of the movie Batman Begins, Ra's Al Ghul is also the head of The League of Assassins - a group Black Canary has had numerous dealings with - in the comics. The ship Ollie is trapped on in the end of the episode is called The Amazo. Amazo is the name of a Justice League villain - a robot built to replicate the powers of any superhero. Black Canary makes use of some sort of hand-held sonic device while rescuing The Hood from Laurel's ambush. The device can apparently be aimed in one direction (Oliver shows no negative effects standing behind Black Canary as the device is used) and is capable of breaking glass within an enclosed space while physically disabling people within the blast radius. In the Birds of Prey comics by Chuck Dixon, Black Canary made use of a similar device at a time when she didn't have her famous Canary Cry sonic scream superpower. The Arrow makes use of a tranquilizer dart. It lasts for precisely 36 minutes. Quentin Lance: You said trying another way? Maybe I am too. Laurel Lance: Whatever guilt you're feeling, you're just using it to justify a vendetta. Quentin Lance: (glancing at her bulletin board for The Arrow) Well, maybe I'm not the only one. Oliver Queen: You think that caring about people gets you killed. I think it's what keeps people alive. Quentin Lance: Just for the record, I'm not a huge fan of dangling helpless girls in front of psychopaths like meat. Quentin Lance: Well she must really believe in you. The Arrow: So did your daughter. Quentin Lance: (sighs) She suffered a loss. Grief's got a way of shifting a person's beliefs. But then you know all about that. You've lost people too, right? The Arrow: (beat) Why would you say that? Quentin Lance: Why else would you be doing this? Quentin Lance: This city needs help. I just became less particular about where it comes from. Shado was a pre-med student before her abduction. Black Canary put five would-be rapists in the hospital and seems to be focusing her attacks exclusively on men committing acts of violence against women. Ollie makes a reference to "The Merlyn Job" (122) when he must break into the police station to hack the computers manually. Felicity makes reference to infiltrating a mob casino (121) and jumping out of a plane (201) when Ollie objects to her acting as bait for The Dollmaker. Moria Queen makes reference to having more secrets as she speaks to her lawyer. Laurel is kidnapped and put in peril purely to traumatize her father. Was it really necessary for The Dollmaker's device to involve a long tube forcing liquid down young women's throats? 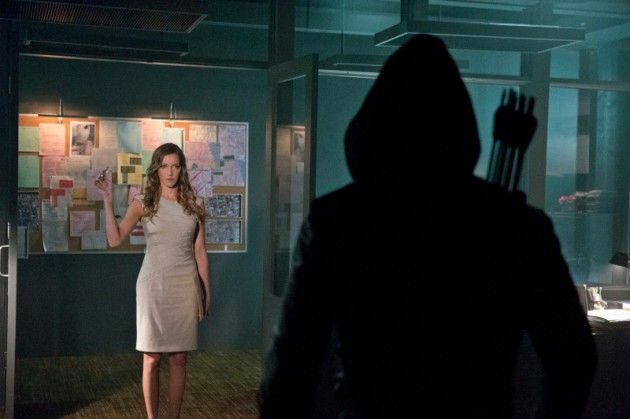 At least the incident makes Laurel realize the truth about her mad-on for The Arrow, so hopefully that tiresome bit of characterization will disappear soon. It seems questionable for Ollie to allow Diggle out into the field at the same time as Lance. I know Quentin is your new best friend, Ollie, but the dude is still a detective even if he doesn't have the shield anymore. He'll probably put 2 and 2 together if Ollie Queen's personal assistant AND personal driver are helping him out. A powerful episode with some intense action sequences that promises more of the same in the episodes to come. Our first glimpse of Black Canary in action for an extended period makes this episode worth watching by itself. Throw in a truly thrilling serial killer plot and some good character development scenes for Paul Blackthorne to play with and you have a truly amazing hour of television.